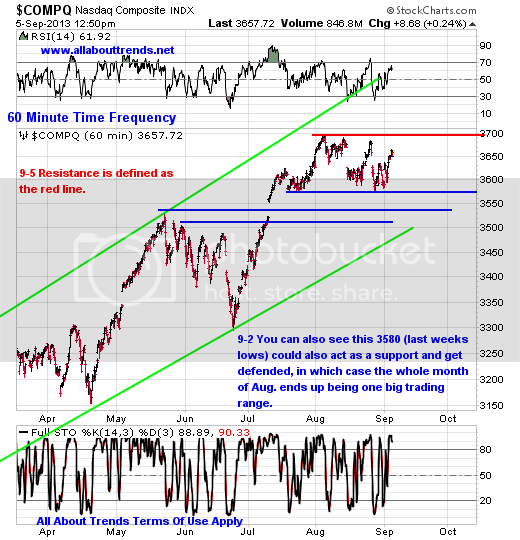 Look no further than the short term micro chart of the NASDAQ Comp here and you’ll see. One can also see that we’ve filled a gap too. Now this all may be nothing but we don’t know that as I can still build a case for us working higher after a digestion of the recent few days worth of gains to relieve short term overbought conditions. Short term though we are stretched (like 80 some points higher in the last few days) and that is going to need to be worked off either sideways or down. That’s part of the reason we locked some gains and reduced some exposure this morning in PRAA and YNDX. Another thing we have to pay attention to here is the news out of Washington. I hate news driven markets but the market has been paying attention to what’s going on in Washington with regards to a Syria vote. Odds favor a Yes approved vote sends the market lower, a No vote could easily spike us higher and to a retest of recent highs. 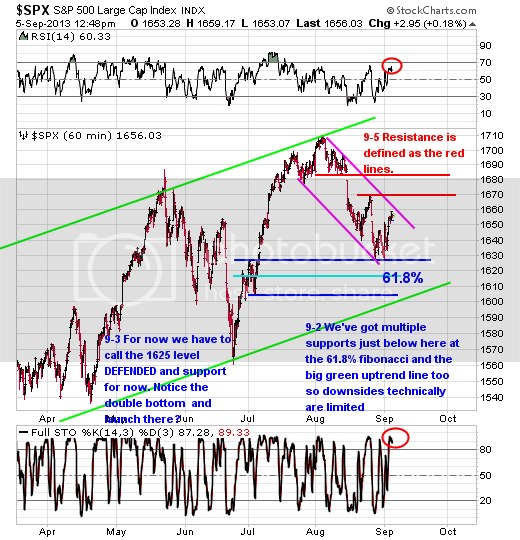 The NASDAQ Comp has best chance of retesting those highs, but then what? It’s resistance you know. And let’s not forget this is STILL Sept.. The SPX? Ya that’s going to be a stretch in order to get it too to retest its highs. 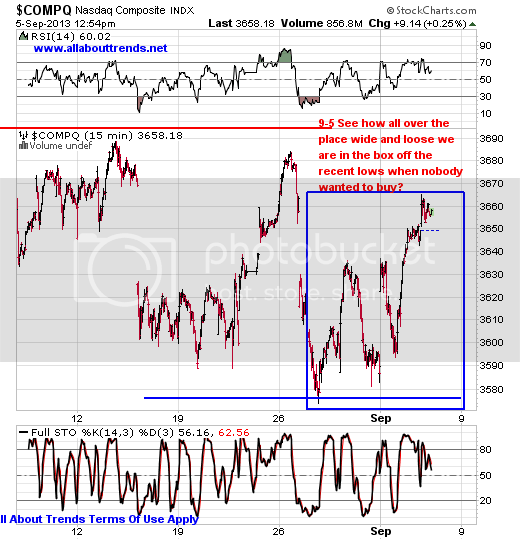 So news driven wise here we are again in most likely a sink or swim holding the market hostage situation. No matter though as we have our risks defined and in the event of a yes approved vote on the use of force? Well we’ve already locked some gains which would offset gap down weakness. So for now? Let’s work with what we have as we have a fair amount of exposure. We have a nice start to the month with the total value of our portfolio up about $2,729.00 for the month. Not bad for THREE DAYS into the new month. Now that may not seem like a lot but we’ve really never really took positions that amounted to more than 7% of our portfolio per position. And really never got more than 50% invested. Know what’s neat about that? On a monthly basis over the course of 12 months it amounts to $32,748 and based upon the total value of our portfolio it annualizes out to around 17-18% all while rarely never using more than half the portfolio. Think about it? 17-18% per year while never using more than half the portfolio? Nothing wrong with that if you ask us. Actually a ballpark of what we’ve accomplished over the last 5 years has been about 20% per year and that is net of losses too. All here too never rarely going over 50% invested. Sure beats having to be fully invested in a cookie cutter index fund if you ask us. Let’s just keep on keeping on with “Trade What We See” and take it a step at a time all the while never having to get fully invested and at the mercy of the market to achieve the same returns if not more. A lot can be said for having a large cash position as it adds a sense of security as well. After all we all know that there is going to come a time right? A time where cash is king vs. remaining fully invested and at the mercy of the market when you wish you weren’t. Free 2 Week Trial Here!